If it is your goal to become a better, more knowledgeable and well-rounded rider, it’s a good idea to get your hands on whatever material you can find to help you do that. Riding motorcycles is by no means an exact science, so getting different perspectives on riding can only be a good thing. Personally, when I first made a conscious effort to learn, I headed the way of Keith Code and the Twist of the Wrist material. Being so comprehensive and methodical was perfect for my way of learning and from his teachings alone I made a lot of progress. However, while I liked a lot of what Keith had to say, I still always had an open mind and the desire to get different perspectives. 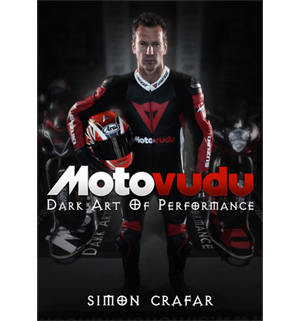 One of those perspectives comes from Simon Crafar and his Motovudu material. Knowing just how accomplished Simon is, I was excited to listen to what he had to say having heard a lot of good things about his teaching style. Simon is an ex 500GP and World Superbike racer turned track day coach. He has reached the very top of his game, getting multiple podiums in the World Superbike Championship, and is a race winner in 500 Grand Prix. There’s no doubting the guy can ride! After spending some time teaching others at track day level, he discovered that he had a real love of teaching and helping other riders reach their goals. He has now become a popular coach on the scene and has subsequently released his own book, and this DVD which is based on the book. Where the Twist of the Wrist material breaks things right down into different rider attributes and then deeply dissects each of them in an attempt to pass on a deep understanding, Simon’s Motovudu material takes quite a different approach. Clearly Motovudu is the no nonsense approach to riding, something that many riders will prefer. Simon’s material quite simply is ‘this is what I do’, and I’m sure he would make no attempt to deny it. The DVD is broken down not into different disciplines, but instead (apart from body position) into the different stages of a corner. In each area Simon tells you exactly what he does, with a somewhat brief explanation to go with it. There’s also an extra section all about the man himself and his thoughts on racing, riding, teaching and life in general, showing he just genuinely is a really nice guy. It’s very good material, no question. Not all racers have a good way of conveying how they go fast, but given Simon’s time teaching many a track day rider it’s no wonder he has developed a good way of getting his teachings across. Some of what he says clearly (and I would guess, deliberately) fly in the face of what the likes of Keith Code teaches in his books and in his California Superbike School. You will definitely learn a thing or two (or seven) from this DVD, even if you have read/watched everything else available, or are well invested in someone else’s teachings. I certainly did. The quality of the product is top notch too. Twist of the Wrist is looking a bit old in the tooth now (and the cheesy acting is unnecessary), whereas the quality of the camera work as things are being explained are a lot nicer, and easier, to watch. Seeing Simon back it into turns in super slow-mo is pretty neat too! Some might call it complicating things, I prefer to call it comprehensive. Another criticism would be that there is virtually zero information on vision, which I think is something riders really need to become aware of. Where we look and how we see things can have a big impact on our riding. Lastly, I don’t think a newcomer would find it very easy to utilise in their quest to ride better. I feel Simon’s less broken down approach would better suit those with a decent grasp of what is expected of us already. Even given those criticism though, I definitely feel it’s worth the money and I would recommend it to anyone looking for another riding guide to get their hands on. There really is some quality stuff in there, and his different view gave me plenty of moments of realisation. While it hasn’t changed my opinion on what other coaches teach, I definitely look at some aspects in a different way, and it has further shown me that in the instance of riding bikes on the track, there is more than one effective way to skin a cat.